Farmhouse sinks are a timeless classic, offering great aesthetic appeal as well as lots of space for washing up large pots and pans. While the traditional farmhouse sink is made from porcelain, they are now available in a wide variety of materials, including natural stone. We’ve put together some design ideas to help you choose the perfect farmhouse sink for your kitchen. Natural stone is much more customizable than materials like porcelain and stainless steel, so your stone farmhouse sink can be made with any design and to fit whatever space you have available. You can even have an ornately decorated sink like this marble example. You really have the freedom to choose how your farmhouse sink will look. Most kitchens display a nice polished aesthetic, with smooth porcelain or polished stone displayed prominently. To make your farmhouse sink stand out, you could choose a more rustic style instead. Sinks can be carved from natural stone and left unpolished to produce that natural, rustic finish. Soapstone is a great option for that rustic look. You can have fun when choosing the material for your countertops and farmhouse sink. Use the same material and design for both to create a seamless finish, or contrast two different materials to make your farmhouse sink really stand out. A dark granite sink could offset white marble countertops, for example, or vice versa. Choose a combination that lets your sink and countertops complement each other perfectly. Natural stone is great for outdoor use, as well, because it is durable and weather-resistant. A farmhouse sink can look great in an outdoor kitchen. Or maybe you just want an outdoor sink in your backyard or front porch for a convenient water supply while you’re gardening. Soapstone is an especially good option for outdoor use. 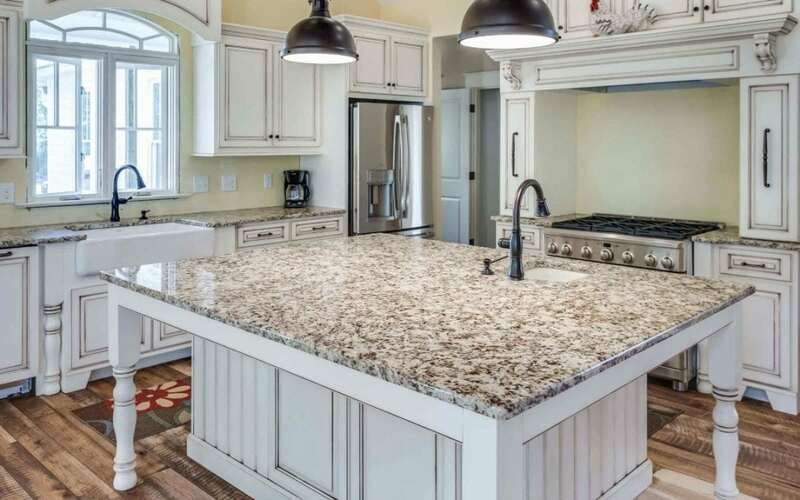 Because farmhouse sinks typically stick out slightly from the countertops and cabinets, they can pose a bit of a safety risk in a house with children. Designing your sink with a smooth front surface and curved corners helps to make those bumps a little softer. It also produces a sleek finish, adding a bit of modern style to a more traditional piece. If you’ve got space for it, then a double farmhouse sink is a great design option for your kitchen. This provides even more space with two basins side-by-side. If you cook a lot, you could have one side for dishes and the other for food preparation. The size of each basin is up to you, depending on the space you have available. Designing your farmhouse sink and your countertop should go hand in hand to make sure that they suit each other stylistically. If you need countertop installation or design ideas around Winston Salem, Greensboro, High Point, and Kernersville, then get in touch today.